One of the benefits of being a comic collector is that Christmas fun can be enjoyed at any time of year. Just select a festive issue from the nearest available pile of funny papers and you'll soon be experiencing the echoes of excitement from Santa's visits of long ago. At the time of writing, Christmas 2015 is still a couple of months in the future, but I've just emerged from wallowing in the seasonal slapstick and holiday humour which comprised the Christmas 1987 issue of Whizzer and Chips (while doing the research for my Whizzer and Chips – The Cheeky Raids series of posts). As of Christmas '87 Whizzer and Chips stars the Bumpkin Billionaires were as ever engaged in their futile quest to return to their former impoverished state, and their bank manager was continuing to thwart every money-losing scheme that the wealthy wurzel-munchers would devise. The manager, who was never named in the strips as far as I know, had an assistant named Miss Wobblethrope. I like Miss Wobblethrope – she could have been depicted as a glam secretary, but she's pleasingly ordinary. But mainly I like her for her name. A lesser imagination would have conjured an obvious, Bond-referencing name and called her Miss Moneypudding or similar. She could have been called Miss Wobblethorpe, which would have been funny enough, but someone had the genius idea to call her Wobblethrope, which must be one of the great comedy names in comics. ..I don't know if someone on the W&C payroll had partaken of a few too many mince pies before committing this festive fable to paper, but they got their 'thropes' and 'thorpes' a bit confused. Page 21 was the site of the toothy funster's Thursday adventures in the first two issues of Cheeky Weekly, but Friday muscled into the same location for issue 3. Seven days later the first page of Mustapha Million's story came to rest on page 21, after which Friday returned for a 6-week run. In the 31 December 1977 Christmas issue, Mustapha again occupied the subject location with a tale in which a plan to visit his pals on a sleigh pulled by two camels was thwarted by a heavy fall of snow. Friday then resumed, this time for 4 issues. Home Movie then made its single page 21 appearance ( a film entitled 'El Bullfighter' was on show), following which Friday was back again, this time for a marathon 11 week stint. Our pecunious pal Mustapha then made another of his irregular page 21 visits, before Friday again took up residence, this time for 5 issues. Page 21 in the comic dated 10 June 1978 was shared by a half-page Joke-Box Jury and, as the summer months commenced, an ad for that year's Buster Holiday Fun Special. Friday returned for 2 weeks before being dislodged once more by Mustapha, who this time was a little more determined and managed to hold on to page 21 for 4 issues. Friday then moved back in for one week, after which Mustapha resumed control, but only for one issue. A previously-unseen-on-page-21 combo then arrived in the 12 August 1978 comic, when advertorial feature What's New, Kids shared the page with the gag-evaluating panel of Joke-Box Jury. This particular combination of elements would not be seen again on the page under examination. A week later the subject page was again host to a page 21 one-off as Cheeky Weekly's silicon-chipped sage and human owner Charlie turned up on the page for a single time. Our middle-eastern moneybags mate Mustapha then re-established his presence for a 5-week run. This was followed, in the 30 September 1978 issue (which was the subject of some upheaval as a result of the commencement of the Mystery Comic in the centre pages), by Thursday returning for 9 issues. The comic dated 02 December 1978 included an ad on page 21 for Trebor Double Agents boiled sweets. Consumers of the spy-themed confectionery could send off two wrappers and a 90p postal order and in return receive a super, cap-firing Spy Gun. The following week page 21 returned to some sort of normality as Friday resumed occupancy, but this was to be the final time that Friday appeared in that location, bringing the number of Fridays on page 21 to 31, and making Friday the most regular occupant of the site under investigation. Seven days later Thursday moved in again. However it was all change once more in the subsequent edition dated 13 January 1979 as two ads for IPC titles shared the page in question; Roy of the Rovers was marking the new year by printing part one of Roy Race's 1979 Calendar, whereas Tiger's celebratory scissor-snipping sales incentive was the first instalment of the 6-part Sports Diary 1979. In a surprise move, filler feature Silly Snaps assumed control of page 21 for 3 issues before being ousted by yet another page consisting of two elements. The first was an ad for IPC's Mickey Mouse comic which that week was offering two packs of stickers based on Walt Disney's animated-and-live-action feature, Pete's Dragon. The same title had two weeks earlier given away a free Panini Pete's Dragon sticker album in which to stow the sticky-backed images (on that occasion the ad was on page 8 of Cheeky Weekly). The second half of page 21 in that 10 February 1979 issue contained a message from Cheeky asking readers to name their favourite celebrity. The responses would be used to compile a cut-out-and-keep Top Ten poster, which was eventually published in the four April 1979 cover-dated issues of the toothy funster's comic. Thursday then returned for a week, followed by Silly Snaps for a week, after which The Burpo Special made its sole visit to page 21. The infant interrogator's subject that week was Krazy Town's snootiest citizen, Posh Claude. In the 10 March 1979 issue, page 21 was again host to two advertisements. This time an ad for the Smurfs Poster Magazine Special shared the subject location with another advert for Mickey Mouse comic, which was by this time running a competition to win a trip to Disney World, Florida. In order to participate in the excitement, readers of the squeaky-voiced rodent's title had to collect a four-part Walt Disney World Giant Poster, which would later be the subject of questions. Readers supplying correct answers to the Disney posers would be in with a chance of a transatlantic trip to meet Mickey and his pals. Page 21 in the following issue was again the subject of fillage, as a Tease Break came to rest in that location, on its only outing to that part of the comic. Thursday's final page 21 appearance happened in the 24 March 1979 issue, bringing its total visits to that location to 14 and making Thursday the third most regular page 21 resident. The next week saw another pair of ads turn up on page 21. 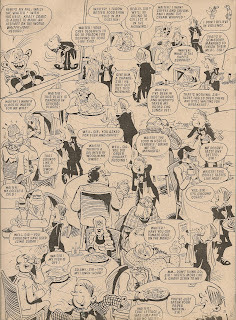 The first was publicising the commencement of IPC's 'Comics Go Pop' cut-out-and-keep promotion in Whoopee, Whizzer and Chips and Cheeky Weekly as of the next week's issues (Cheeky would begin printing the Top Ten poster mentioned earlier). The second ad was for the second issue of IPC's short-lived adventure title Tornado, which came with a free cardboard gift, the Mayday Pack. The presence of the Top Ten poster instalments in the April 1979 issues resulted in the contents of The Mystery Comic being somewhat displaced. Thus Disaster Des rocked up for a week, after which our alliteratively-monikered mate Mustapha Million resumed occupancy for 2 weeks, then World War 2 amnesiac and Whizzer and Chips reprint Mystery Boy made his sole page 21 appearance. As things got back to normal in the 05 May 1979 edition, page 21's contents consisted of a half-page Joke-Box Jury and a cartoon-strip ad for North Pacific Flyers, a range of model 'planes, kites and 'whizz rings' marketed by Hales. There were more ads on page 21 in the following issue, as IPC's 'Free Milkshake' promotion entered its third week, and it was the turn of Whizzer and Chips readers to enjoy a refreshing lactic libation courtesy of Kellogg's (who only provided the flavoured mix, the milk had to be sourced from the family fridge). Also on page 21 that week was an ad for the Frankie Stein Holiday Special, tempting prospective readers with the promise of 'the freakiest fun special ever'. 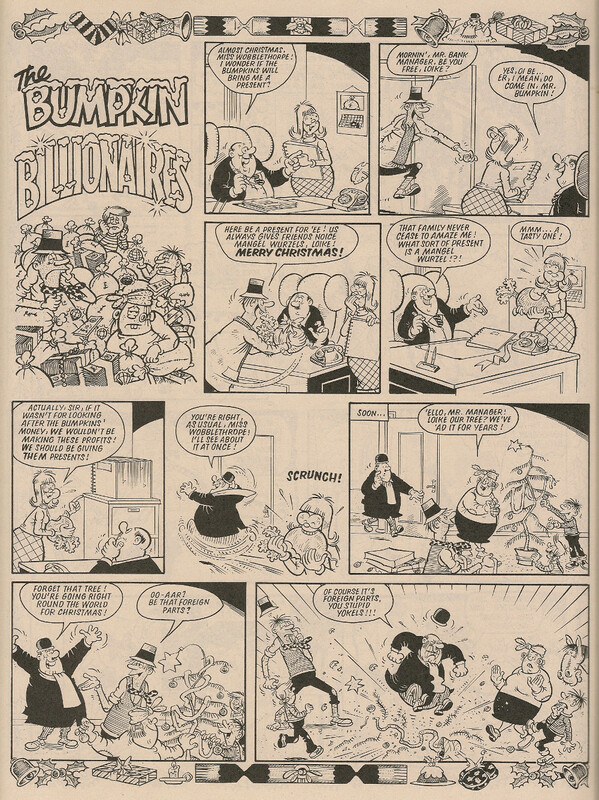 even days later the same advert for Frankie's special appeared on page 21, but this time its companion ad was publicising IPC's new entrant into the humour/adventure comic category (the same group into which Cheeky Weekly fell) – Jackpot, the third issue of which was in the shops that week, with a less-than-scintillating 'magic numbers' card game as the free gift. In the following Cheeky Weekly issue there were no ads on the page under scrutiny, but neither was there a comic strip – the second cut-out instalment of the Cheeky Spotter Book of Town and Around (a rather boring variation on the I-Spy books, in which Cheeky Weekly readers were invited to spot such objects as a street lamp or, rather less common on the streets of Britain, a French onion seller! ), the launch of which coincided with Cheeky Weekly's turn to offer a sachet of Milkshake mix, came to rest in that location. Page 21 in the 02 June 1979 comic was again the site of 2 ads, one for the Buster Holiday Special, and the other for North Pacific Flyers (although it was a different version of the NPF ad to that mentioned earlier). The final part of he Cheeky Spotter Book of Town and Around fetched up a week later. This 6-week run of ads or cut-outs on page 21 came to an end in the 16 June 1979 edition when Joke-Box Jury moved back in. The judges of joviality were in fact in control of the subject location for 2 weeks, but there followed 2 issues in which page 21 again hosted a pair of ads for Summer Specials. On these occasions the identical pairing of ads promoted holiday hilarity of the Cheeky and Whizzer and Chips varieties. 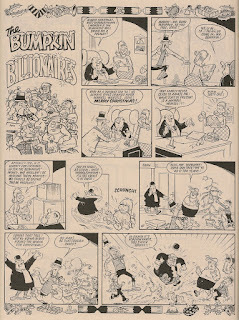 After 10 weeks of ads, cut-outs and Joke-Box Juries, comic strip capers returned to page 21 in the form of Lolly Pop, although as the tight-fisted tyrant was in fact publicising his home comic, Whoopee, as part of the Star Guest promotion, there was an element of advertising to this resumption of strip activities. For the next 3 editions, wealth continued to be the subject examined on page 21, but unlike miserly Pop, our chum Mustapha Million was back and generously splashing his cash and dishing his dosh. The teeny entertainers of Stage School (a then made a speculative visit to page 21 but evidently didn't like the location as they never returned to that part of the comic. Our wealthy Arab chum clearly had no such reservations and turned up for another 3-week sojourn which in fact brought to an end his visits to the page under review. This made Mustapha Million the second most regular inhabitant of page 21, having clocked up 21 visits. The feuding father and son team from Why Dad Why?, having been freed from the confines of Cheeky Weekly's centre section when the Mystery Comic concept ended in the 30 June 1979 issue, then made a surprise bid to take control of page 21 in the 08 September 1979 edition, but were ousted a week later by a shared page consisting of Chit-Chat letters and the corpulent comedy of Tub. Seven days later, Chit-Chat was sharing the page with an ad for IPC's magazine aimed at those who enjoyed putting their mental faculties to the test, Puzzle Time. 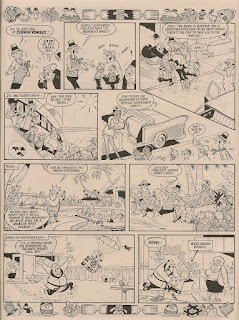 The 29 September 1979 edition saw Disaster Des make his second and final page 21 outing, after which the Chit-Chat/Tub combination appeared in that location for 3 issues. The third page of an extended Joke-Box Jury came to rest on page 21 in the 27 October 1979 comic, but the following week Chit-Chat shared the page with a coupon inviting readers to place a regular order to ensure their weekly dose of Cheeky chuckles. There then followed the final Chit-Chat/Tub combo to appear on page 21, after which our portly pal got the whole of page 21 to himself for the first time. However, the heavyweight humour was short-lived as Why Dad Why? Moved back in and monopolised page 21 for a 6-week run. Tub then moved back in for the 5 weeks remaining before Cheeky Weekly was cancelled. 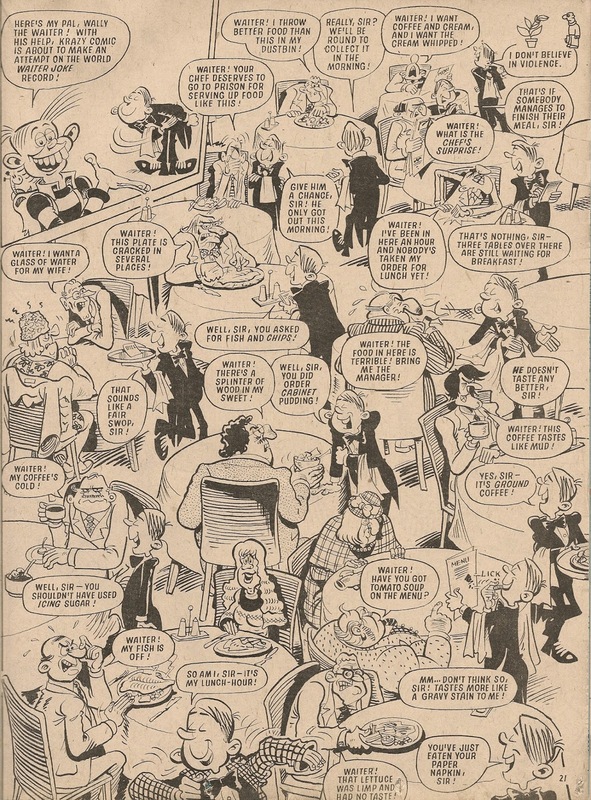 In this latest post in the Rejects series, in which I'm examining the named characters who appeared in Cheeky's strips in Krazy but failed to make a transition into Cheeky Weekly, the spotlight falls on Wally the Waiter. 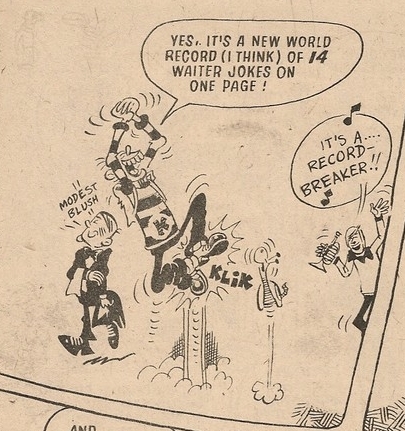 Wally the Waiter appeared in just a single 'Ello, It's Cheeky strip in Krazy (cover date 12 March 1977), but what an appearance it was. The dynamic dinner-deliverer set a new record for culinary quippage as he wisecracked his way around a restaurant, dispensing gustatory gags and mealtime mischief. Wally was adjudged by a celebrity panel consisting of Cheeky and Roy Castle to have served up 14 waiter wisecracks, but despite this prodigious feat of feasting fun, Wally never returned to the pages of Krazy. One can imagine the gag-cracking garcon being easliy assimilated into the ranks of Cheeky's pals in the toothy funster's own comic, with Cheeky's wanderings around Krazy Town including a saunter past the local restaurant, but Wally was entirely absent from Cheeky's own title. Maybe Wally's record attempt in Krazy exhausted the scriptwriter's supply of restaurant raillery. It's possible the Cheeky Weekly editor felt that Auntie Daisy dished up sufficient food fun for one comic. Or maybe Cheeky believed his plate-wrangling pal's adroitness with the funnies threatened his own seat at the top table of comic jokesters. The Great News For All Readers blog is currently taking a nostalgic stroll along the streets of Krazy Town to revisit a certain youthful gagster with prominent teeth and a stack of crazy chums. The post nicely encapsulates the elements which constituted the toothy funster's comic and reminds us why Cheeky Weekly was so great. Not only that, there's a super free gift!